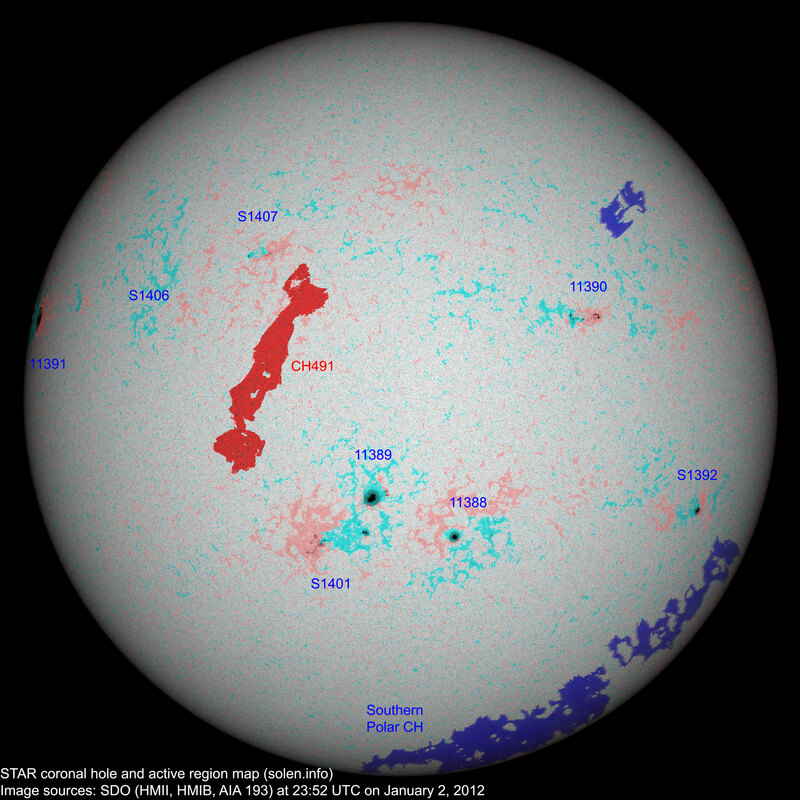 Last major update issued on January 3, 2012 at 04:30 UTC. 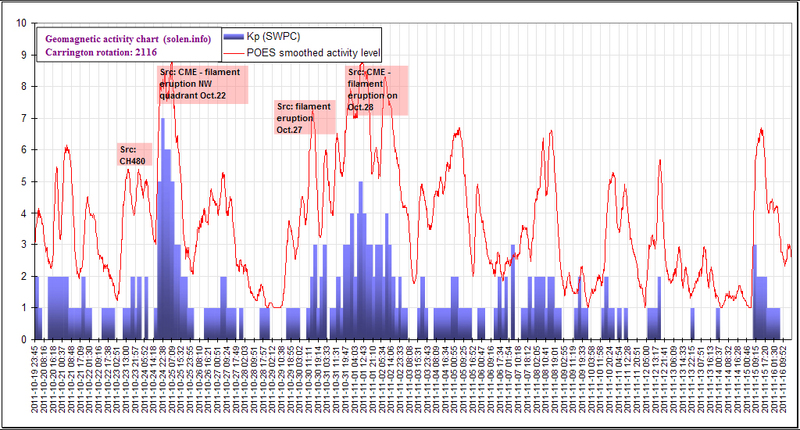 The geomagnetic field was quiet on January 2. 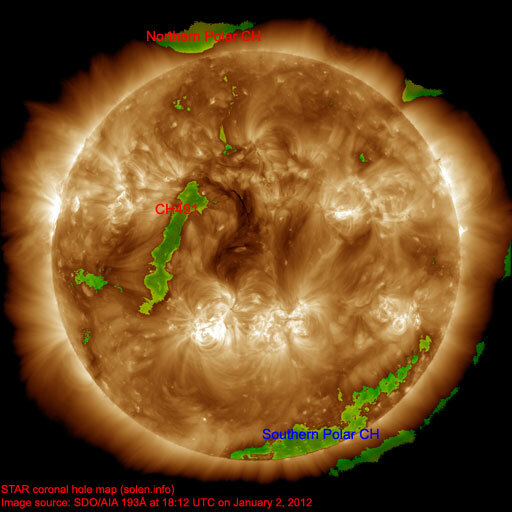 Solar wind speed ranged between 344 and 471 km/s. 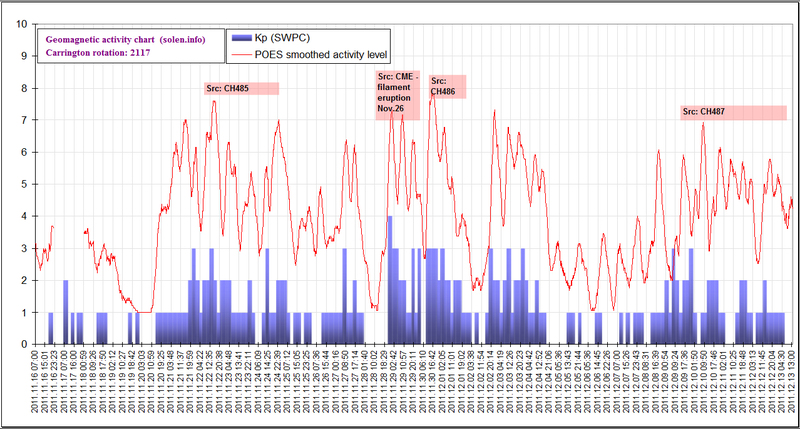 An unexpected solar wind disturbance began after 17h UTC, solar wind parameters indicate a CME origin. 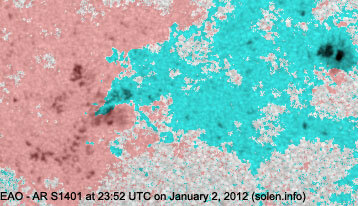 Solar flux measured at 20h UTC on 2.8 GHz was 134.7 (decreasing 16.4 over the last solar rotation). The planetary A index was 4 (STAR Ap - based on the mean of three hour interval ap indices: 3.9). 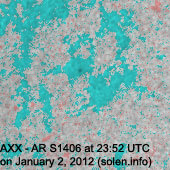 Three hour interval K indices: 00002122 (planetary), 10113222 (Boulder). 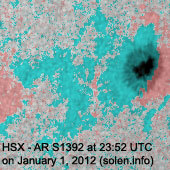 Region 11388 [S23W08] was quiet and stable. 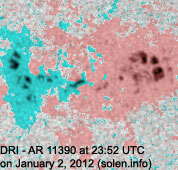 Region 11389 [S16E05] added a few spots and has reversed polarities. 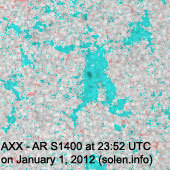 Note that SWPC includes region S1401 in this region. 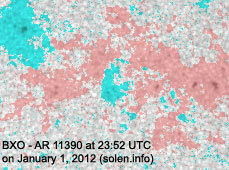 Region 11390 [N11W30] developed many new spots as new flux emerged. 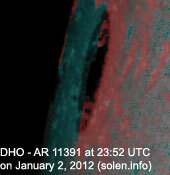 New region 11391 [N12E82] rotated partly into view at the northeast limb. The leader penumbra is large and extends 4 degrees latitudinally. M flares are posssible. [S1401] rotated into view at the southeast limb on December 28 and developed significantly in the central and trailing spot sections on Dec.29-31. The leading spot section decayed on January 1. 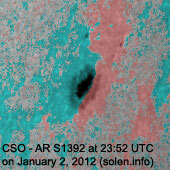 Quick decay was observed on January 2, particuarly in the trailing spot section. Location at midnight: S23E10. 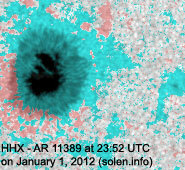 Flares: C1.6 at 05:28, C1.5 at 07:24 UTC. The most significant event of the day was a long duration C2.4 event peaking at 15:24 UTC from a source just behind the northwest limb. 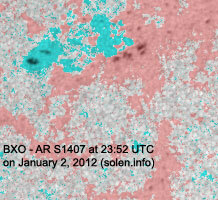 This event was associated with a minor proton flux enhancement. 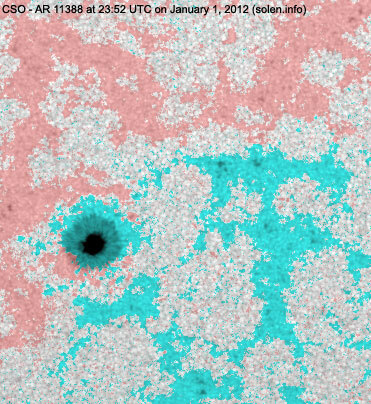 December 31 - January 2: No obviously Earth directed CMEs were observed in LASCO and STEREO imagery. 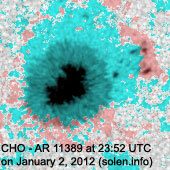 A recurrent trans equatorial coronal hole (CH491) will likely rotate into an Earth facing position on January 4-5. 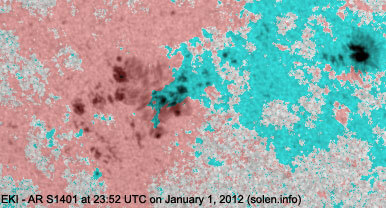 The geomagnetic field is expected to be quiet to active on January 3 and quiet on January 4-6. A high speed stream from CH491 could cause some unsettled and active intervals on January 7-8.